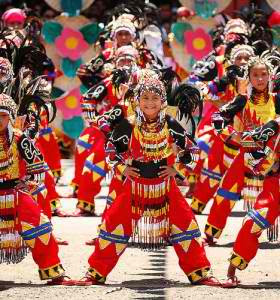 This month's festival highlight is with the Biggest City in the world, Davao City, as it celebrates the KADAYAWAN Festival this August 20-24. This culture-rich and colorful merry making has been realized in line with the thanksgiving of the people and tradition of extravagant festivals here in the country. Being proclaimed as the King of Festivals, this celebration promises a grand parade of orchid-bedecked floats and tribal street dancing. The history of it's existence has started from the original tribes of Davao giving gratitude to their gods in the foot of Mount Apo. It has been said the that the term "Kadayawan" comes from the a vernacular term "Madayaw", a friendly greeting that means that a person is beautiful and valuable. Davao is one of the must-visit places here in the Philippines. With the wide range of tourist sites, It also offers native fruits and flowers that are endemic here in the country. It is the home of one of the most intriguing fruit, Durian ("taste like heaven, smells like hell", as the locals tagged it), "waling-waling" (an oriental orchid, and the habitat of the largest eagle in the world,the Philippine Eagle. Being one of the key-cities in the Philippines, Davao City stands with grandeur as the Mt. Apo (tallest peak in the country) securing its heights in the region.The locals in Davao is the most gentle and organized in the country. Being one of the cities with lower rates of mischief, it's has been a model to any other cities in the country. Davao City is now a stedfast leader in progress in the region and has been showing no signs of slowing. It's because of the people and the honor of it's richness in heritage.